צד אחד דמותה של מלכת אליזבת' השנייה עם המילים "Elizabeth II Australia 50 Dollars 1/2 oz 9999 Gold 2016"
דמותה של מלכת אליזבת' השנייה עם המילים "Elizabeth II Australia 50 Dollars 1/2 oz 9999 Gold 2016"
מטבע זהב Perth Mint שנה לונרית שנת הקוף שנת 2016 משקל חצי אונקיה For 2016, the Perth Mint's internationally renowned Australian Lunar Silver Coin Series II celebrated the Year of the Monkey, the ninth animal in the 12-year cycle of the Chinese zodiac. These superb quality releases are perfect for people born in "monkey" years - 1944, 1956, 1968, 1980, 1992, 2004 and in 2016 - who are regarded as clever, intelligent, flexible, quick-witted and versatile. Personality traits like gentleness and honesty bring them an everlasting love life. The reverse of each coin depicts a monkey sitting in a peach tree, with a peach hanging down in the top of the coin's field. The peach tree is symbolic of immortality in Chinese art. 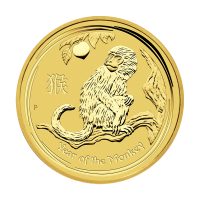 The Chinese character for "monkey" and the inscription "Year of the Monkey" also appear in the design along with the Perth Mint's traditional "P" mint mark, the year and weight. As well as appealing to gold coin collectors, these outstanding releases also make great gifts for people born in any year "ruled" by the Chinese lunar monkey.